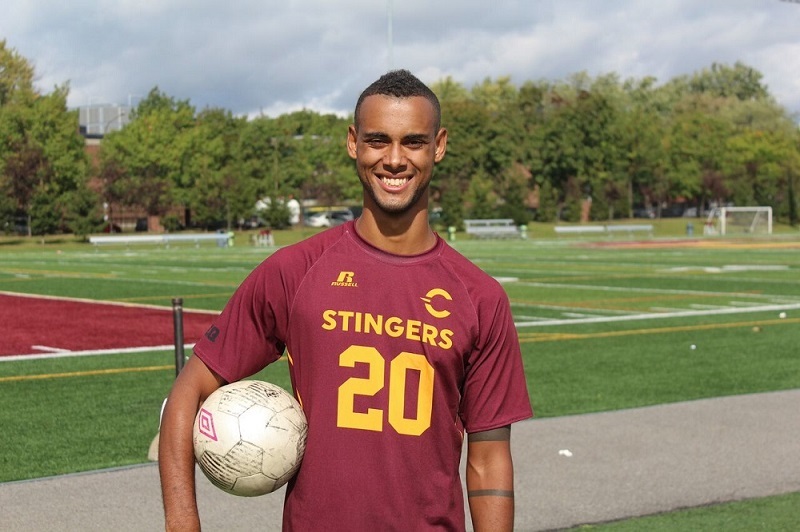 I had the pleasure to get to know Olivier Georges, the centre-back who has captained the Concordia Stingers men’s soccer team for the last two-and-a-half years. I spoke to him after a team practice, and the first thing that struck me was how different he was compared to when I’ve spoken to him after matches. Constantly smiling and very laid back, he didn’t seem like the same guy who’s so focused and intense during games. My first time watching Georges play was at CEPSUM, on the Université de Montréal campus, where the Stingers faced off against the Carabins, a top team in the Réseau du sport étudiant du Québec (RSEQ). The game did not go Concordia’s way—the Carabins won 7-3—but the first thing I noticed was the centre-back wearing number 20 who was in control of his team even before the game started. He pumped his team up by vocally encouraging them before the game, and was directing his teammates on where to position themselves during the game. His style of play and control of the Stingers back line was everything one could hope for from a defensive leader. Despite constantly being vocal and organizing the play, he always managed to calm his team down when on defence. The more I watched the Stingers, the more he became one of the most consistent and entertaining players on the field. Off the pitch, Georges is anything but the fiery and passionate defender who seems to be everywhere at the same time during the game. He is smiling and always willing to chat, even after a tough loss or a grueling practice. At a young age, when most players wanted to score goals, Georges never really expressed a desire to play as a forward. He preferred defending his goal rather than attacking his opponent’s. Olivier Georges right where he belongs: in front of his goalkeeper, defending his net, during the 2016 season. Archive photo by Alex Hutchins. He isn’t afraid of stepping up to help his team attack, as he is good in possession of the ball. He embodies the newer generation of defenders like Real Madrid’s Sergio Ramos, who are rising in the professional ranks because they can shut down any attacking forward but could also score goals themselves. Regardless of how comfortable with the ball or how quick he is, Georges always preferred playing defence. And he’s quite good at it too. Georges was named a RSEQ Second Team All-Star in 2014 and 2015, and a RSEQ First Team All-Star in 2016. The RSEQ All-Star teams consist of the best players in the conference from a given season. For Georges, who also ran track and field and played varsity volleyball, soccer has always been his favourite sport. Despite getting an offer to play for the semi-pro St-Hubert Soccer Club last summer, Georges is uncertain about his future career in soccer. “I was way too busy, but maybe after I graduate I can think about playing there. But I have no definite plans for the future of my career,” he said. Georges is currently studying Teaching English as a Second Language (TESL). It offers a lot of opportunities to teach abroad and that is something he wants to do. “That’s definitely been a dream of mine,” Georges said. “I’ve always been fascinated by travel and to be able to go abroad to teach would just be a dream come true.” Teaching also requires a lot of leadership and direction, which is what Georges shows with the Stingers right now. Having been an integral member of the Stingers since his freshman year, Georges has experience with the hectic and perpetually busy life of a student-athlete. Although he will be saying goodbye to the Stingers jersey at the end of this year, he has left behind a lasting impression with the team. And I’m sure opponents won’t forget his ability to defend against attacking players either.